I have always wanted a vintage dress form. I love the muslin covered ones with the cage on the bottom. When you can find them they usually go for big bucks. A few years back my sister Carol purchased a vintage dress form, the kind used by seamstresses that have several adjustable parts. She painstakingly took it apart and covered each panel with a gorgeous vintage barkcloth. My sister is a master seamstress herself and she took meticulous care to match up the pattern and the dress form turned out to be a stunner. So jealous I couldn’t stand it I started looking for my own dress form to cover in a similar fashion and turn into an accent for my sewing studio. I didn’t find a vintage one, I didn’t recover anything myself, what I did find was this lovely. 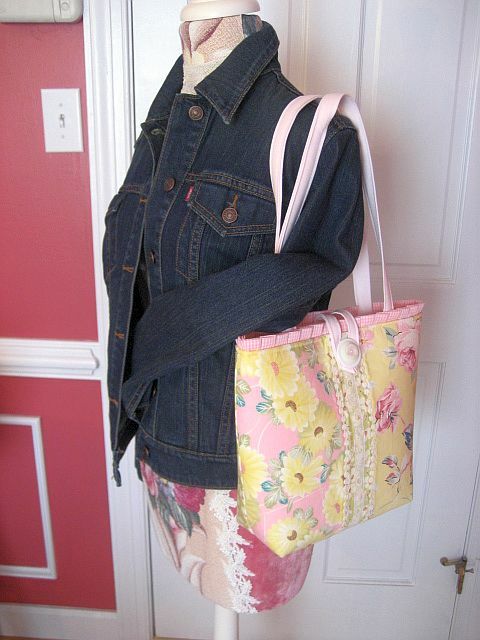 I found her on eBay and the person that created her is none other than Janet at Shabby FuFu. 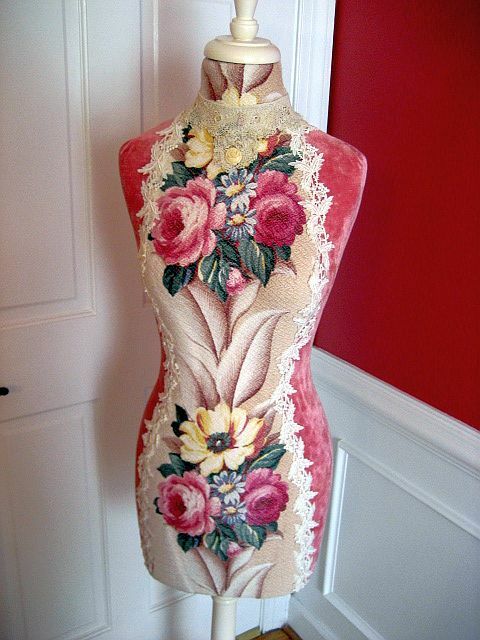 Janet made her using a foam mannequin form and covered her in beautiful vintage Glencourt Roses barkcloth and pink cotton velvet. I love her and such an elegant lady needed an elegant name so I call her CoCo. She is my wonderful model and I use her always when photographing my creations for eBay or etsy. Here she is modeling a scarf that I just created for my etsy shop using my vintage fabric and lace scraps. Now she is modeling one of my totes. 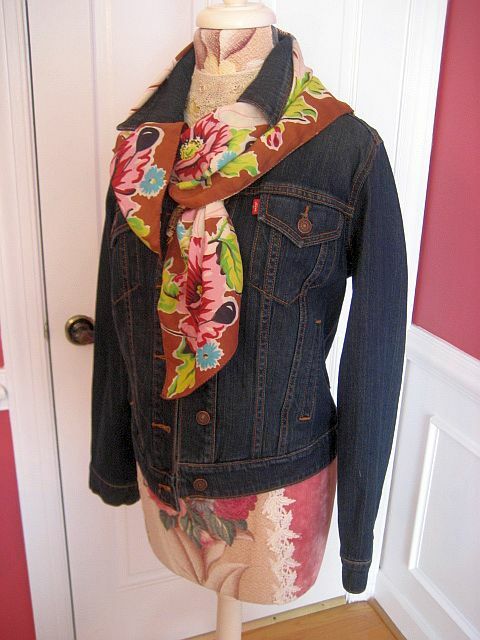 Here she looks stunning with my jean jacket and vintage barkcloth era scarf. 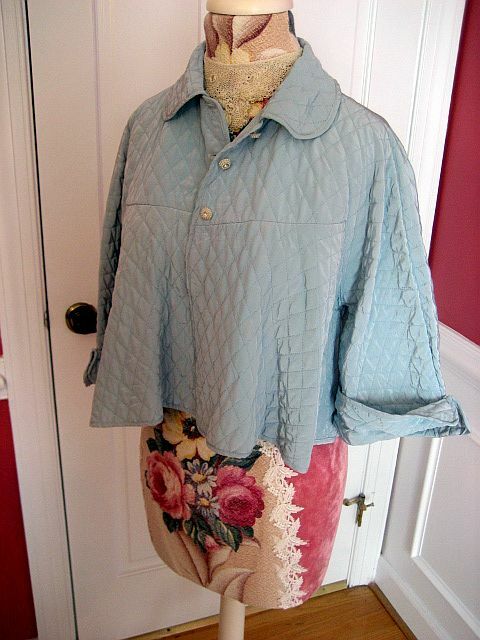 Now she is wearing a vintage bed jacket that I bought at an estate because it is the most beautiful shade of blue in quilted satin and has pretty little MOP buttons. Whether she is wearing props or just standing alone in all her glory she is my favorite model! I love her Suzy!! I’ve been wanting to see more of her from your other pics. Such a great idea! Wow! Coco is stunning! And your scarves and tote are the perfect accessories for her. Coco is lovely, what a great combo with the velvet and barkcloth. And the barkcloth scarf is so pretty. I’m glad you are participating in the Romantic Country party! See you there. Oh Suzy CoCo is beeeutiful!!!! What a wonderful find she was!!!! I have a mannequin and her name is Veronica! She is not as beautiful as CoCo but she makes me happy! I absolutely love CoCo. I’m so jealous!! Oh she is so beautiful! I love her! 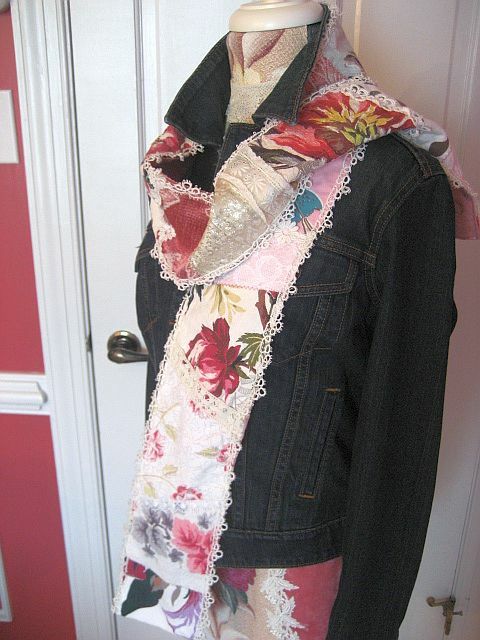 And that scrappy scarf is to die for!!! I have a dress form too sitting in my studio. Her name is Ethel after my favorite show I Love Lucy. Off to gander at your Etsy!!! Coco is so chic!! and oh i want one too!! keep seeing them in magazines and such a statement of female beauty and just plain fun to plain with sort of grown up paper dolls in 3d.. Your mirror is to die for!! CocO is so OH LA La! I love all that you do! Have a great day! Smiles….